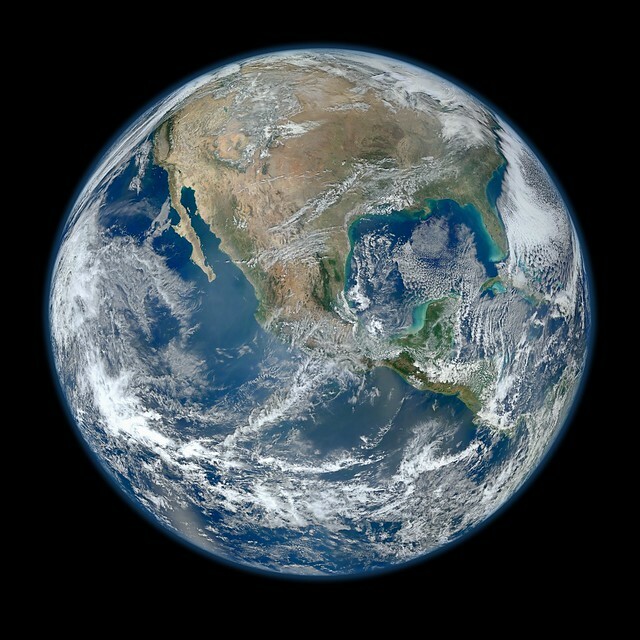 NASA's latest take on "Blue Marble." Click the image to go to Flickr where you can view an 8000x8000 resolution version. You can even make out L.A.! Forbes’ writer Jon Bruner gives us a behind-the-scenes look at the centralized computer system that controls Los Angeles’ traffic signals, adroitly extending green lights here and improving timing there. The end result? “Repeated studies since the 1990s have found that travel times fall by 15% near connected signals and motorists make 20% to 30% fewer stops.” The benefits are so manifest that L.A. has licensed its proprietary technology to other cities for a cool $75,000. In my experience, the lack of signal timing is a major gripe among big-city residents around the country. At the Transportation Research Board conference, Transportation Secretary Ray LaHood seemed resigned to no new surface transportation bill this year. Here’s his quote: “Given the politics, the number of days that remain, the differences between what the Senate and House are looking at — I think its very unlikely we will have a surface transportation bill during this year of Congress.” Attentive readers will recall that the current bill expired in 2009 and has been living on short-term extensions since — and that makes it harder for states and localities to do long-range financial planning. In my humble opinion, over the next couple decades we’ll absolutely need it: to improve mobility, to reduce dependence on fossil fuels and to avoid expanding airports and highways. But I’d agree with some of the critiques in this NYT discussion that there are a number of different ways to get to that end — and it doesn’t necessarily have to look like what’s currently being proposed. The Sacramento Business Journal reported the other day that new CAHSR chairman Dan Richard says there’s a “big surprise” on the way, so stay tuned. While LA licensed computerized traffic light synchronization, Japan licensed, wrote the books, and patented computerization of mass transit. When can we get ATOS here in LA? The centralized traffic light coordination system may certainly help motorists, but it ends there. That same system hurts mass transit because it precludes good transit priority and/or preemption and does not take station or curbside bus stops into consideration. Having preemption would mean partially disrupting some of the all-so-precious synchronization for cars at a particular light and LADOT just simply can’t stand for that. So people can talk all they want about “keeping traffic moving” while the very system that makes that possible actively disrupts the flow of transit. The best example of this problem is with the orange line bus (but also with the street running LRT sections). I take the orange line bus frequently and also cross it when driving and I can certainly say that cars have way more traffic light priority over the busway. It also highlights the problem with building backbone transit lines at-grade in a city which consistently favors the flow of individual autos over transit lines. Actually, the LA signal synchronization system isn’t to blame for the lack of transit priority; the system is designed to be capable of doing it. It is a management and ultimately political decision to prioritize cars over transit. If LADOT wanted to give the Orange Line absolute priority tomorrow instead of the current one priority bus per x number of minutes, it could do it. @ATSAC: Interesting… Does the system also have the ability to integrate pedestrian and cyclist traffic? Never mind… I just read the article and it sounds like the system can (LADOT just chooses to prioritize cars over people by making pedestrians push a button or by limiting crosswalks at intersections). Good points about priority, but does that include active preemption? Because the only example of what seems to be non-gated preemption in the LA area is marmion way on the gold line and I’m not sure if that’s true preemption or if its just synced to the train. When traveling northbound along marmion towards highland park station the train never stops (this is how all the LRT lines SHOULD behave when street running), however when pulling out of the station going southbound toward union station, the train starts to pull forward waits for a brief moment then proceeds down marmion uninterrupted.